Our Gold Medal Gyms facility is state of the art and has many amenities and conveniences that we are very proud of. From the viewing area for parents to the incredible state of the art gym, we’ve thought of everything. One feature we’re especially excited about is our Pro Shop. We’re confident that you’ll love it too! Those involved in gymnastics or cheerleading are familiar with the need for very specific gear and equipment. It can be a hassle to go out and find what you need for your classes or for competitions. Fortunately for our athletes, our Pro Shop carries the majority of the things they will need in order to succeed in your classes and competitions. 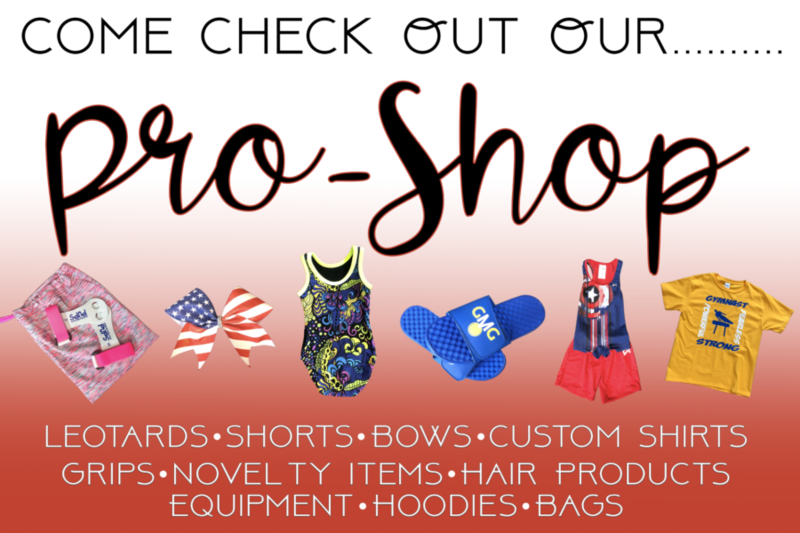 In the shop, we sell leotards, gymnastics equipment, bows and hair products for our cheerleaders, etc. From equipment to apparel, our Pro Shop has it all. If you’re new to gymnastics or cheer and need help choosing the right gear, our coaches and helpful staff will be close by to answer questions. And the Pro Shop isn’t just a place to buy gear for your class or teams. If you have a gymnastics or cheer fanatic in your life, we also have products like hoodies and t-shirts that would make great gifts. You can also make custom orders through the Pro Shop so make sure to ask our staff about that! At Gold Medal Gyms, we know exactly what our athletes need in order to succeed in cheerleading and gymnastics. This is what makes shopping at our Pro Shop so great. Our knowledgeable staff can help your athlete find exactly what they’re required to have. So next time you’re at the gym, make sure that you stop by and shop at our Pro Shop. We have all that you need and more!